As they open their doors to foreign investors, Chinese capital markets are entering the next stage of their evolution - but what does the future hold? The Chinese equity market has evolved significantly since launch on October 31, 1995 and will continue to do so. With the inclusion of China A-shares and possible future inclusion of mid-cap stocks, emerging-markets indexes will likely further increase their concentration in the Asia region, and China in particular. Change is the only constant. Indexes are living, breathing creatures that evolve in sync with the economy and the markets. Nonetheless, some changes are "man-made" and, in the case of the MSCI China Index, one such series of changes is well-known, announced in June 2017, and recently became effective. On June 1, 2018, MSCI added 234,227 China A-shares to the MSCI Emerging Markets Index in a two-step process, up from 222 as announced last year, owing to subsequent index reviews and stock suspension conditions. Using figures in MSCI's May 2018 Index Review, China A-shares would make up 0.78% of the MSCI Emerging Markets Index once they've been folded in. All the remaining Chinese shares would represent just under 30% of the index's value. China A-shares would represent 2.5% of the MSCI China Index once all is said and done. As Chinese stocks' footprint continues to expand in equity indexes to more closely align with the footprint of the nation's capital markets and its economy, some investors may be asking, among other things, "How large will China's share of these indexes become?" As of the end of March 2018, China's 3.6% share of the MSCI ACWI represented a large disconnect relative to its 14.8% share of global gross domestic product according to data from the World Bank. By way of comparison, U.S. stocks made up 52.0% of the MSCI ACWI, and its share of global GDP was 24.6%. Thus, it seems the best answer to the above question is "larger" and potentially "much larger." Given the expanding influence of China A-shares in Chinese equity indexes, investors should work to better understand the fundamentals of the China A-share market. Morningstar Global Exchange-Traded Product Reports have a "Fundamental View" section that provides a broad overview of the underlying macroeconomic fundamentals that will affect an exchange-traded fund's performance. These reports on ETFs with China A-share exposures should help investors navigate through some of the nuances in this asset class. Our equity analysts' research on specific China A-share companies can also assist investors in understanding the fundamentals of the individual stocks as well as the relevant sectors. Investors should also note that as China A-shares are added to the existing MSCI China Index, industry weightings will also change, especially if mid-cap stocks are added to the mix. 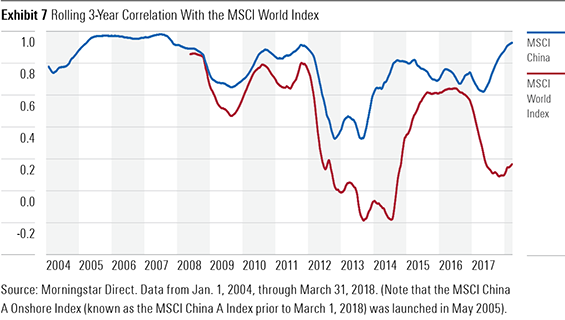 We plotted the rolling three-year correlation of the MSCI China and MSCI China A Onshore indexes versus the MSCI World Index dating back to January 2004. The MSCI China Index's correlation with the MSCI World Index averaged 0.77 during this period. This is indicative of some degree of potential diversification benefit for global investors. However, the future direction of this relationship is difficult to predict given the addition of China A-shares. This is because those shares have historically experienced a lower level of correlation to the MSCI World Index compared with that of the MSCI China Index. Over the past nine and a half years, the correlation between the MSCI China A Onshore and MSCI World indexes was 0.40. If we simply extrapolate this historical relationship into the future, the increasing portion of China A-shares in the MSCI China Index would, in theory, reduce the correlation of the MSCI China Index with the MSCI World Index, implying greater diversification benefits. However, from a broader perspective, the further opening up of the Chinese equity markets, as well as continued globalisation and expansion of trade between China and the rest of the world, will make China ever more global. These factors will likely increase the correlation of the MSCI China and MSCI World indexes in the long run, hence reducing the diversification benefit for global investors. Jackie Choy, CFA is an ETF strategist at Morningstar, based in Hong Kong.